Rivet shelving is easily assembled. No nuts or bolts are required. It is the most economical of the industrial shelving family. 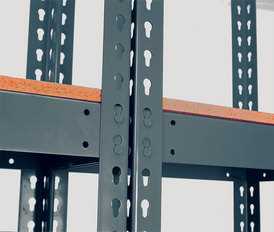 Rivet shelving is rigid, strong, durable, and can handle diverse decks. Single rivet shelving allows for higher density storage. Double rivet allows for higher capacity storage. Rivet shelving is highly configurable and easily adjustable. CSI provides rivet shelving in single rivet versions and double rivet versions. We also offer Steel Shelving, Wire Shelving, Wide-Span Shelving, as well as Shelving Carts. If you need more storage space within a limited footprint consider Shelf Supported Mezzanines.